Weeknights can be super busy this time of year, that’s why I wanted to share with you a quick and easy dinner option that’s also a lighter option thanks to a few easy better-for-you ingredient swaps. This weeknight chicken stir-fry has a lighter flare, thanks to Mazola® Corn Oil. A clinical study showed Mazola® Corn Oil reduces cholesterol 2x more than extra virgin olive oil. To learn more about this claim, see Mazola.com. In addition to the corn oil swap, we’re also swapping in brown rice over white rice and liquid aminos for traditional soy sauce. To get started, the chicken is sautéed in the Corn Oil with a little garlic and ginger. 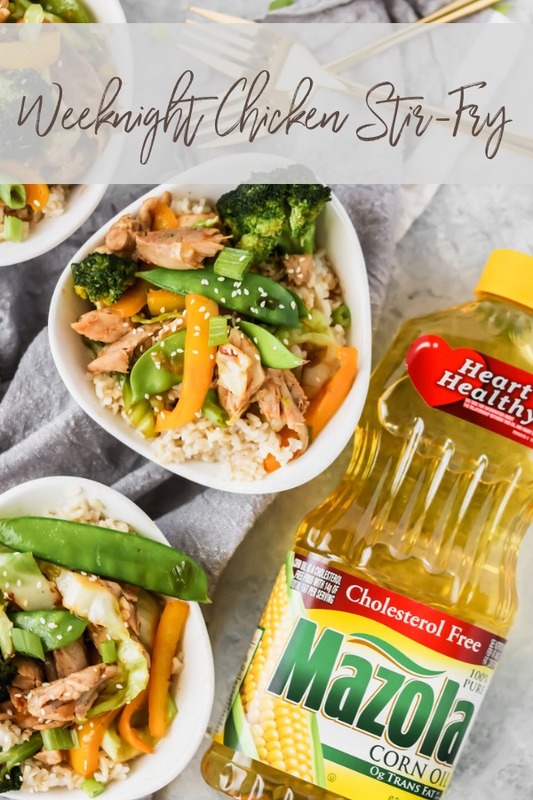 The spices combine nicely to give the chicken that traditional stir-fry flavor, due to the fact that Mazola® Corn Oil has a neutral taste that lets the natural flavor of your food stand out. 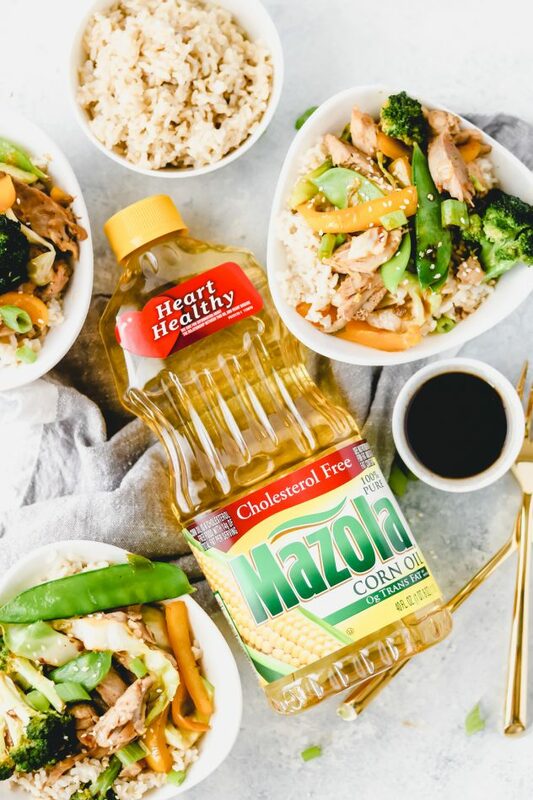 Mazola® Corn Oil is an all-purpose cooking oil that is a smart heart-healthy choice for your family. Variety of uses include baking, grilling, sautéing, stir-frying, or mixing up a marinade or dressing. Which is why corn oil is my go-to oil of choice for any stir-fry recipe. Once the chicken is done cooking you’ll remove it from the skillet and add in your fresh vegetables. Don’t worry about your vegetables tasting a bit off due to cooking them in the same skillet after the chicken. 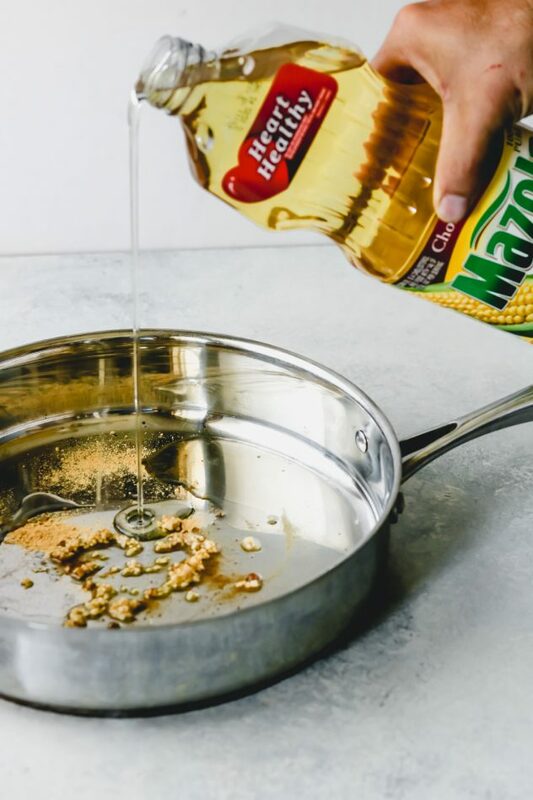 The good thing about Corn Oil is that it has a smoke point higher than most cooking oils at 450°F and performs well in a variety of cooking applications, including stir-frying, sautéing, grilling and even baking. Many home cooks may not realize that all cooking oils have a smoke point that, once exceeded, not only negatively affect the food’s flavor and nutritional value. 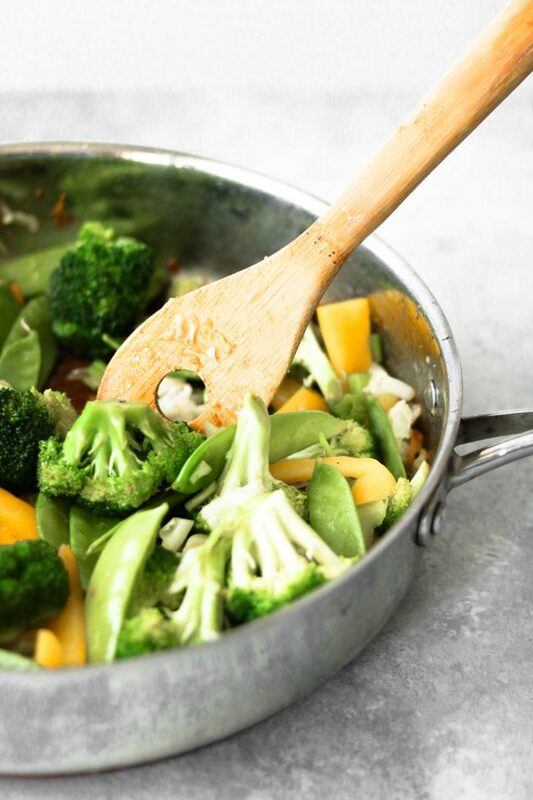 Your vegetables will sauté nicely, without having that overcooked oil flavor. It’s always been a challenge to get my teenage kids to try new vegetables and/or increase their vegetable intake. One dinner hack that has worked well to overcome this challenge is a weeknight stir-fry recipe that’s loaded with fresh vegetables. My kids will devour stir-fry, and this weeknight chicken stir-fry recipe did not disappoint! It makes me feel good that I’m able to swap in lighter ingredients while still offering up delicious flavors. Let’s talk about the sauce, because what’s a good stir-fry recipe without a killer sauce, right?? 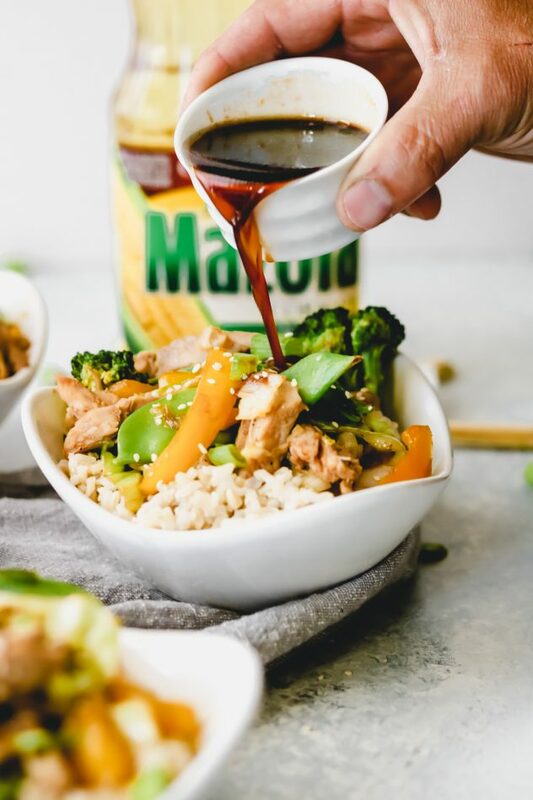 Another better-for-you ingredient swap in this recipe is swapping out traditional soy sauce for straight liquid aminos. Both are traditionally made from soybeans, however, liquid aminos have less sodium than traditional soy sauce, almost 1/3 less sodium. 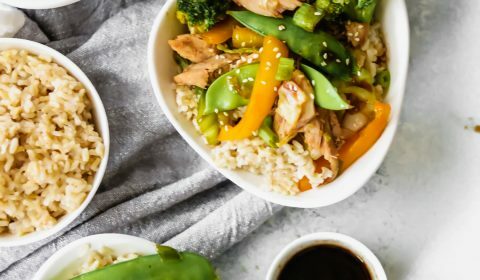 The sauce in this weeknight chicken stir-fry uses three simple ingredients, liquid aminos, honey, and sriracha sauce. So much lighter than traditional stir-fry sauces that normally have much heavier ingredients. While we’re talking about ingredient swaps, let’s talk about our third ingredient swap of brown rice over white rice. Brown rice is whole grain and is generally higher in fiber and other nutrients. White rice has had the husk, bran, and germ removed, which gives it that lighter (white) appearance and is not considered whole grain due to this. lighter dinner option full of better-for-you ingredients. The perfect weeknight dinner with this #MakeItMazola #simpleswap chicken stir-fry dinner. Boil the rice according to package directions then set aside. In a large skillet, (high-walled preferred), add the Mazola® Corn Oil, ginger, garlic, salt, and pepper and heat over medium heat. Stir to combine and let cook for about 2 minutes, then add the chicken thighs, turning occasionally. While the chicken is cooking, prepare the vegetables. Cut the broccoli florets free from the stems. Cut the yellow peppers into thin, julienned strips. Thinly shred the cabbage, and dice the green onion from the top down to just before the root. Set all vegetables aside until ready to use. In a small saucepan, combine the liquid aminos, honey, and sriracha sauce. Heat over medium-low heat, stirring occasionally. Once the chicken is done, remove from the skillet, transferring to a plate. Add one tbsp. of the liquid aminos to the pan and deglaze it just a bit. Add in the yellow pepper, broccoli, and snow peas. Cook until softened. Then add in the cabbage and green onion. Cook until softened. While the vegetables are cooking, slice the chicken into thin slices. Once the vegetables are cooked, add the sliced chicken back into the pan with the vegetables. Pour the sauce over the chicken and vegetable mixture, stir to combine. Divide the rice into individual bowls, top with the chicken and vegetable stir-fry and serve.